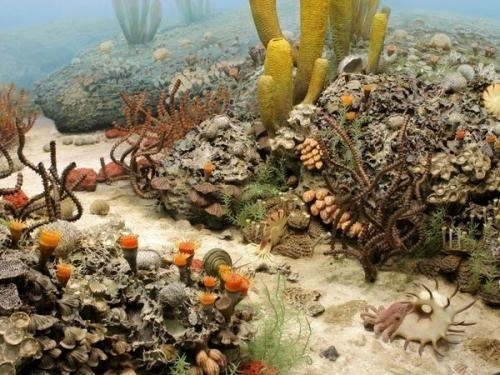 Some 300 million years ago, at the beginning of the Permian period, all the world’s lands had joined into a single supercontinent, Pangea, and all the world’s sea water had formed a global ocean, Panthalassa. 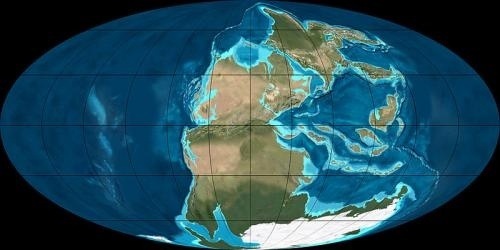 The formation of Pangea led to higher mountains and deeper oceans. According to an equilibrium principle, a giant continent should have a thicker crust than each scattered continent, and the oceans should become deeper. This recession of water away from the land would have eliminated a lot of the biodiversity that thrives in shallow water near the coasts. This recession would have also led to changes in ocean currents and wind patterns, initiating global climate changes. What’s more, the inland region of one giant continent would become dry and arid, leading to the disappearance of much vegetation. But something else also went on, deep within the Earth. When the lands joined, some tectonic plates moved under others and sunk deep into the Earth’s mantle. That cooler material then may have reached all the way to the Earth’s core layer. Evidence for that includes the reversal of Earth’s magnetic field that occurred around that time, an event called the Illawarra magnetic reversal. The accumulation of cool material near Earth’s core then could have led to the formation of a large mantle plume (by a process called thermo-convection), other researchers had suggested. That “super-plume” would eventually reach the Earth’s surface in two separate bursts—first with an eruption in China 260 million years ago, and then with the other in Russia 251 million years ago. By that point, all life had nearly vanished. This entry was posted in Nature, Wonder and tagged it does not require humans to screw things up (it just helps) by Sci Fi Engineer. Bookmark the permalink.